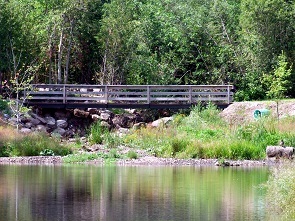 The Quispamsis recreation trails consists of two interconnecting trails, Matthew’s Brook and Saunders Brook. The trails are approximately 9 kilometers in length and are located at the Parks Building, right beside the qplex (20 Randy Jones Way). The Saunders Brook Trail entrance is located across from the lower parking lot. The Matthew’s Brook Trail can be entered just below the tennis courts adjacent to the qplex parking lot. The trails can be used for walking, running, biking and skiing.